Behind LA’s capped teeth, palm trees and perpetual tan, there lies a tremendous melting-pot of cultures and influences (thanks in part to the cosmopolitan transplants who were all in search of a very similar dream at one point or other), which is why it’s all the more gratifying to see a restaurant bold enough to reflect and salute the city’s very multi-culti, checkerboard fabric with such inclusive panache. The former Waterloo & City space is now a quizzical maze of rooms, moods, styles and disciplines, from a saloon-style back bar, to a beachy looking oyster bar; a turn-of-the-century southern diner festooned with taxidermy; an almost Edwardian private room dripping with precious candelabras and key-lime wallpaper and an Umbrian pergola-covered patio. 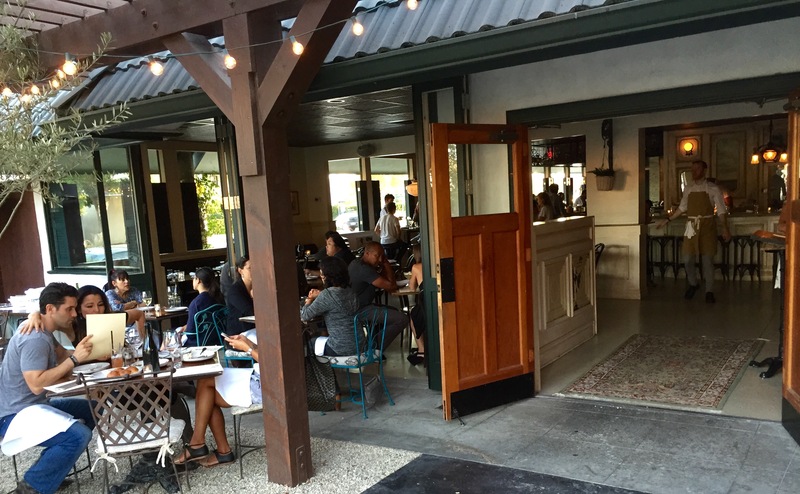 Contrary to many points of view, the only thing truly southern about Brian Dunsmoor’s hearty hearth kitchen, is that it’s located south of Venice boulevard on the (next-to-be-gentrified) edge of Culver City. I would argue that the success of the seven week-old Hatchet Hall goes way beyond “southern-gothic”, as Mr. Dunsmoor flexes his flavor muscles in a variety of hemispheres with an emphasis on local ingredients. With a name like Hatchet Hall, it would be a fair assumption to find oneself confronted with endless cuts of bloody beef and bones, but rather surprisingly, Dunsmoor seems to favor unconventional beans, seeds, salsas, aiolis, seafood and dairy products to bring his dishes their unique (and by all recent accounts – highly popular) appeal. Perusing the sharing-style, five-section menu is a lot like finding the restroom – a delightful (yet much longer than expected) adventure of twists and turns, dotted with highlights, bites and delights – plus an arbitrary surprise here or there. Accompanying the fresh and bi-coastal bivalves is an interesting selection of cured country hams served with pickles and warm bread. Our strictly-casual attired waiter referred to the second section as “snacks”. These include a few imaginative bar-food bites, plus a couple of mention-worthy salads. 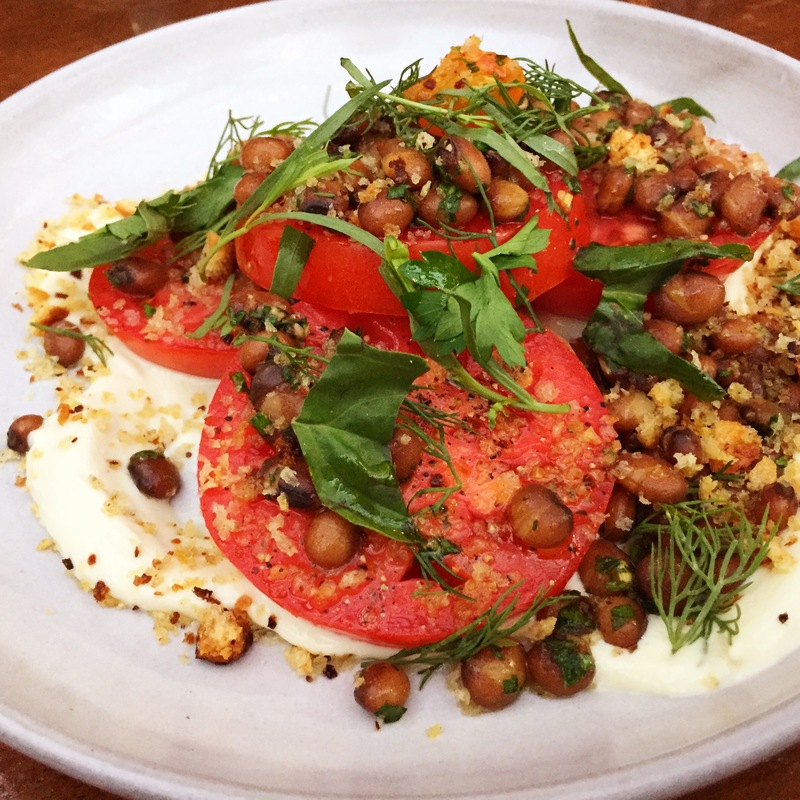 The Sliced Tomatoes are layered over the most amazingly tangy and richly whipped aged-cheddar, with a few crusty breadcrumbs and something called “pigeon peas”, which looked and tasted a lot like a second cousin to the black-eyed pea. 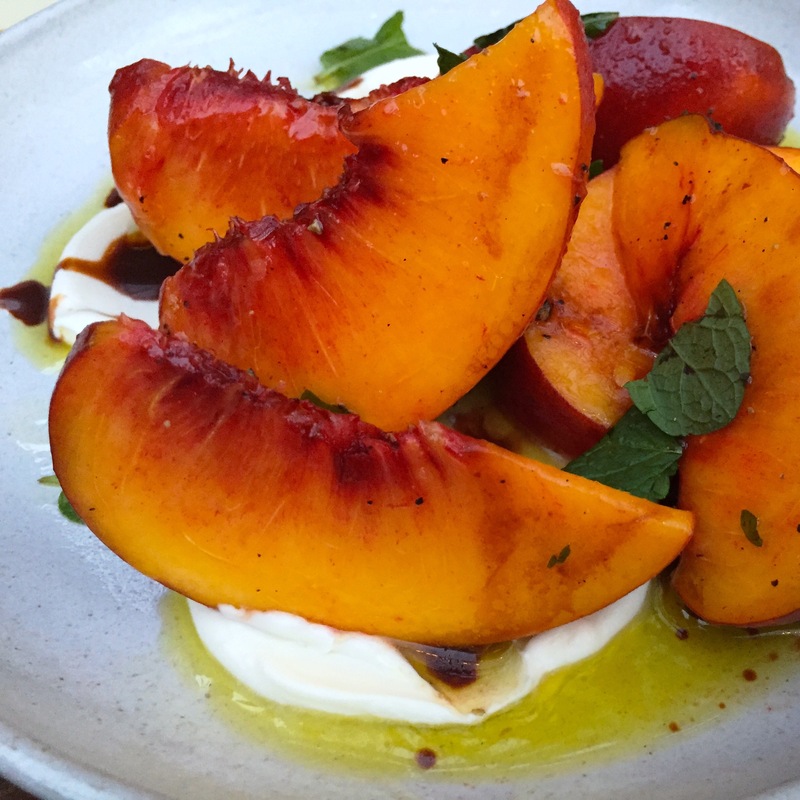 The sublimely charred Market Peach Salad is similarly plated over a froth of yummy, minty cream-cheese, with a dribble of oil and vinegar. 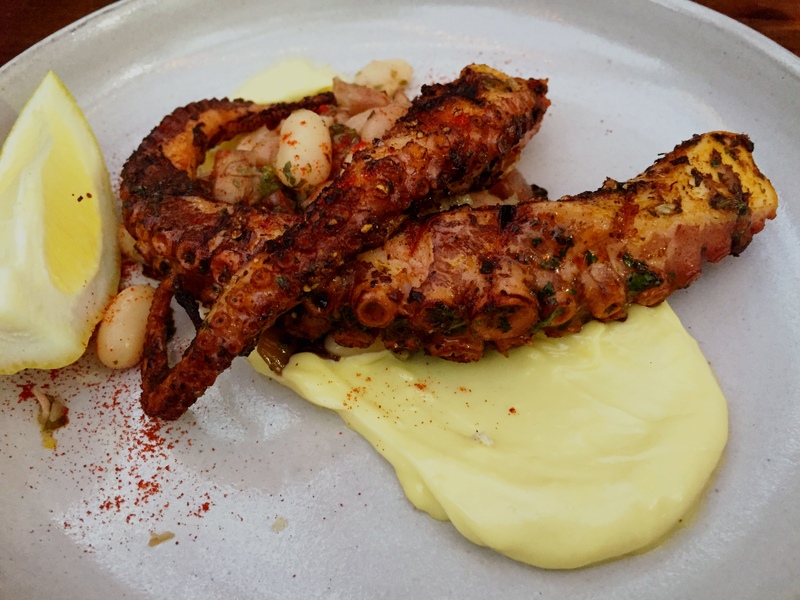 Moving on to hot appetizers, the list includes a couple of organ meats and the much-Instagram’d Skillet Fried Quail – which I’m dying to try on my next visit, but let it be said that the Wood grilled Octopus is pretty stellar; a triplet of crispy, tender tentacles coil lovingly over a puddle of citrusy aioli with a tart salsa verde and a few soft runner beans for company. 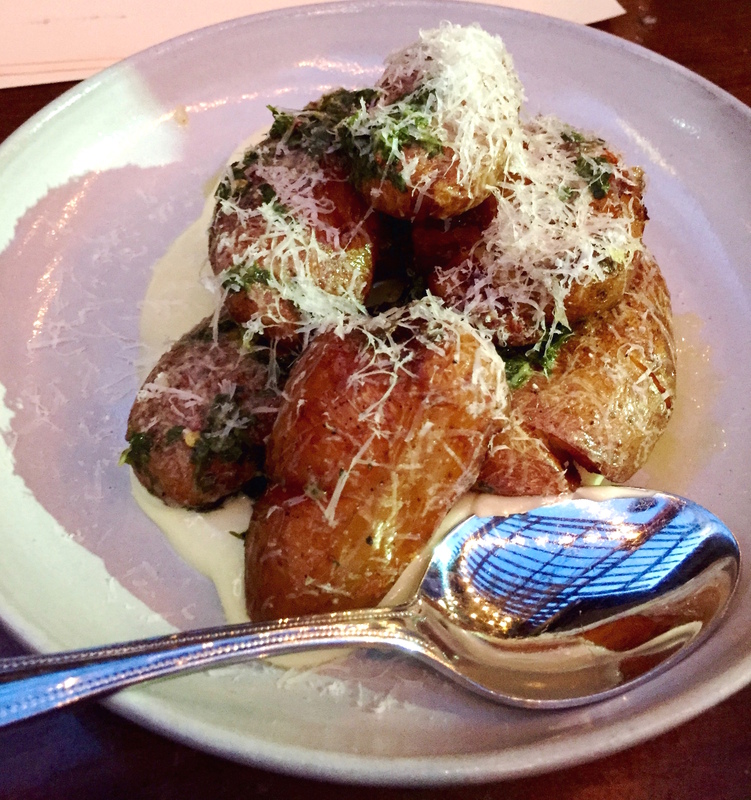 Of the five main options, Chef Dunsmoor prepares three of them in his wood-fire grill. The first is a wonderful take on a traditional Pork Chop with brown butter and charred peaches. 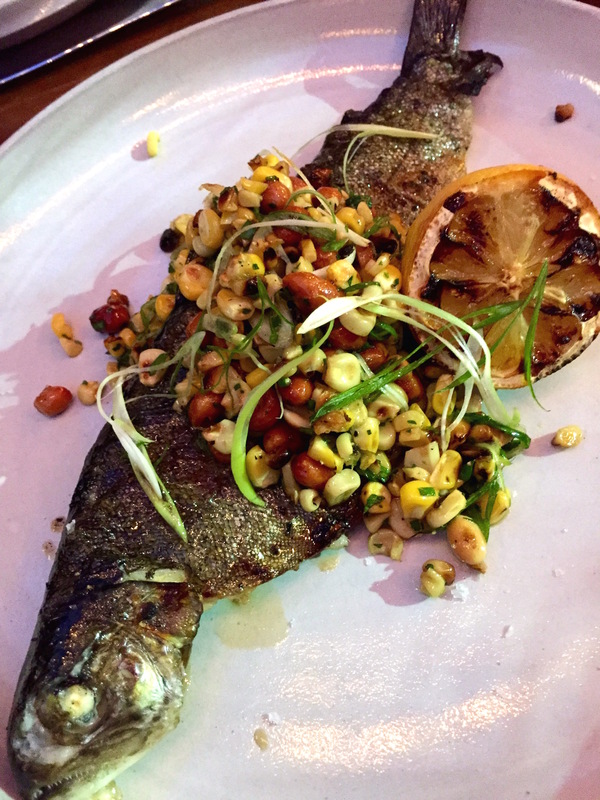 Then there’s a nose-to-tail trout wrapped with a deliciously smoky belt of bacon-y corn and roasted peanuts. 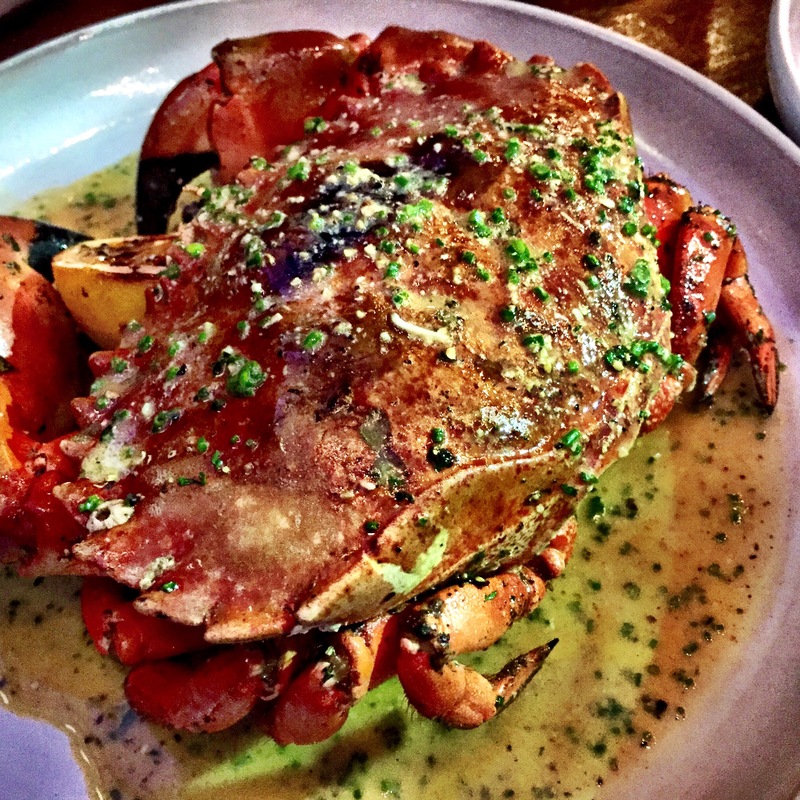 And finally a whole Stone Crab – which arrives triumphantly dappled in a sublime herbed crab-butter, which I devoured greedily with tongs, wrenches and spears as if it were the last crab to ever cross my plate. 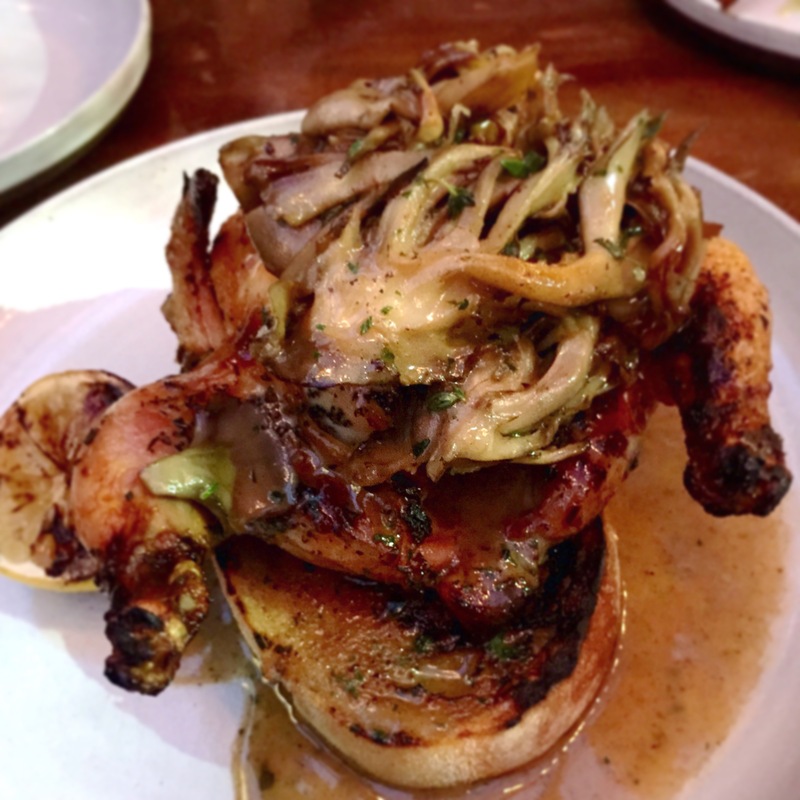 His Game Hen is a formidable contender for the best roast chicken in town. It arrives mounted on a slice of country bread soaking in its own salty, barbecue au jus with a delightfully appropriate crown of hen-o’-the-woods mushrooms. 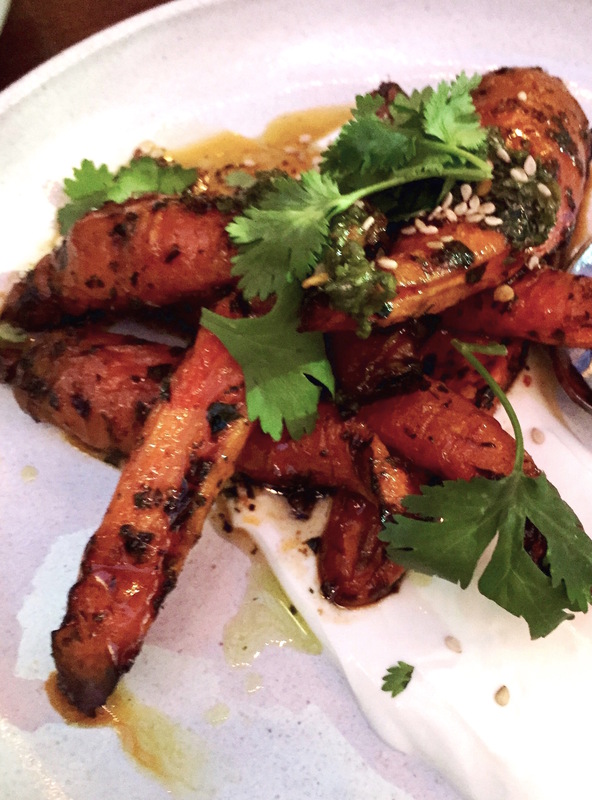 Even the side dishes seemed to enjoy the wood-fire grill as much as their protein counterparts, such as the wonderfully honey-sweetened Chimichurri Carrots or the dill-infused Roasted Beets – the first served with yogurt, the second with crème fraiche. And while I idiotically assumed that duck fat was the ultimate decadence for Roasted Potatoes, Dunsmoor pushes his über-crispy spuds way over the edge with beef fat on a bed of roasted garlic aioli with a garden salsa. Surprise! Surprise! 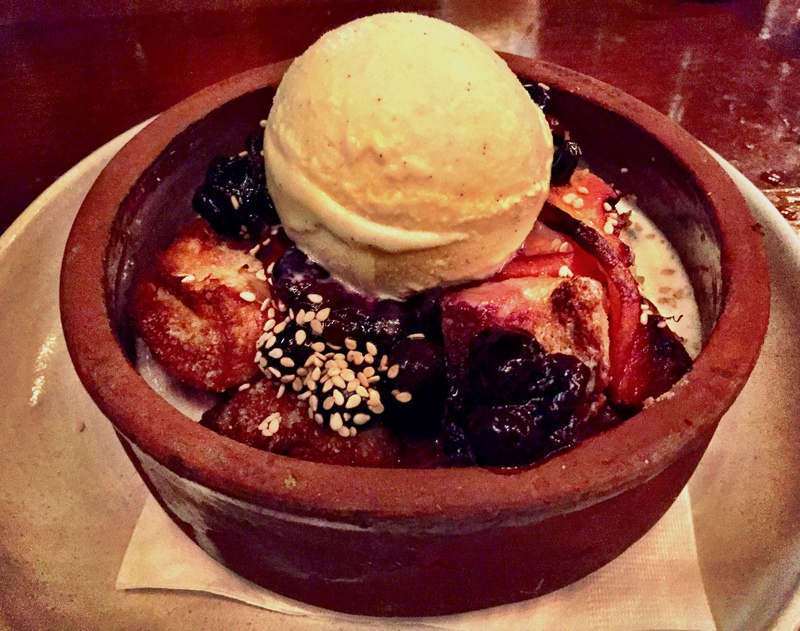 Desserts are just as varied and flavor-forward, from a Panna Cotta made from goat cheese, to a Bread Pudding exploding with blueberries. So, the hell with “southern-inspired.” Could Hatchet Hall be the first truly nouveau-American restaurant – inspired by all of us? Awesome review of Hatchet Hall !